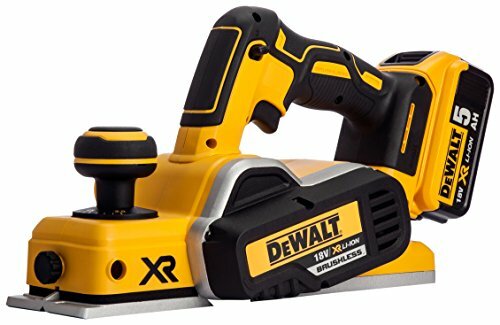 The DEWALT DCP580 XR Brushless Planer has a powerful brushless motor that provides a smooth planing performance combined with extended run time. Lightweight, compact and ergonomic design for comfortable use in all orientations. The large twin blade drum is fitted with TCT blades for high quality surface finish. On-board blade storage and Torx key enable fast blade change, minimising downtime. With a large front and rear shoe for improved stability. It is compatible with the AirLock dust extraction system. DCP580P2: 2 x 18 Volt 5.0Ah Li-Ion Batteries.DCP580N: Bare Unit, No Battery or Charger Supplied. Supplied with: 2 x Tungsten Carbide Tipped Reversible Blades, 1 x Hex Wrench, 1 x Torx Key, 1 x Guide Fence and 1 x Blade Alignment Plate. Specification No Load Speed: 15,000/min.Cutting Depth: 2mm, Rebate Depth: 9mm.Planer Width: 82mm.Weight: 2.5kg.